The Contractors' Council | Why Buy Fiberglass Scaffolding? The quick and easy answer is: it is non-conductive. So if you are working in a situation where getting an electrical shock is a concern, then fiberglass scaffolding is for you. But that’s just one of the benefits and one of my favorite parts of selling fiberglass scaffold is all the interesting applications that I experience and learn about every day. 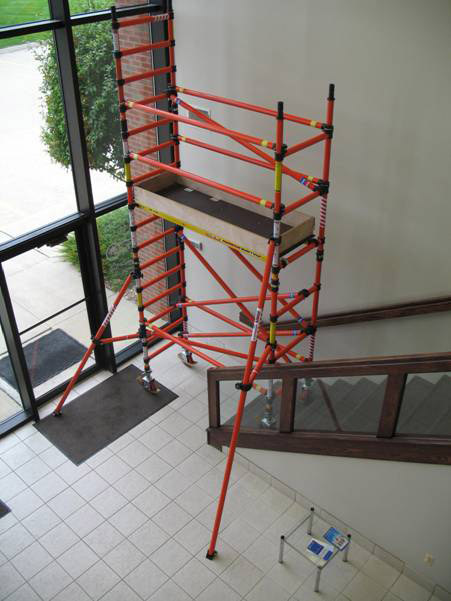 Fiberglass scaffold is lighter than steel and more adaptable in its design than other scaffolding materials. For example with fiberglass scaffold you can put the braces where needed, which is required when building a scaffold over fixed obstacles or on stairs, or in the case of the picture below… both! 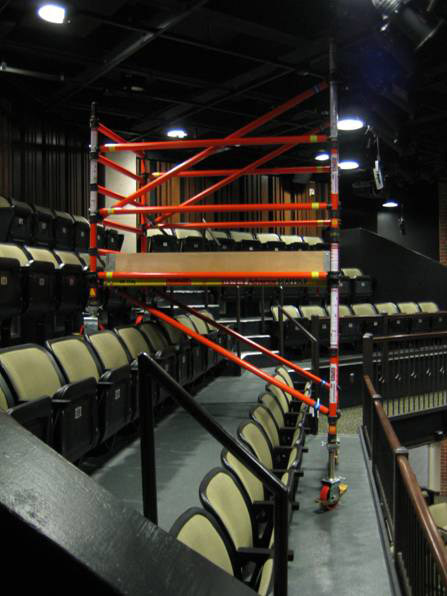 I built the fiberglass scaffold shown below in the balcony of a theater at the University of Michigan, this fiberglass scaffold not only straddles the seats but it is also built on two different elevations. 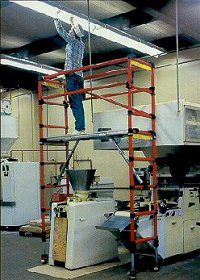 In this picture we see a fiberglass scaffold built on stairs and like the picture above both of these fiberglass scaffolds were built with standard parts and pieces. 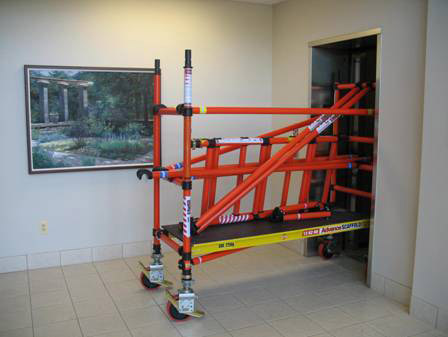 Fiberglass scaffolding is so creative and functional that it can even be made into a cart for easy transportation. Here we see it rolling into an elevator. 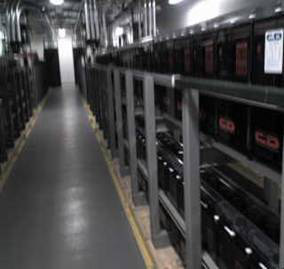 And finally in this picture we see a fiberglass scaffold built over the top of a fixed obstacle, this is a great way to change lights in office buildings above cubicles and is especially handy when the fixed object has voltage, like in a battery room.